Open an Editor Profile for editing and click on the Editor Parameters tab. Select Amazon S3 from the Filesystem list. 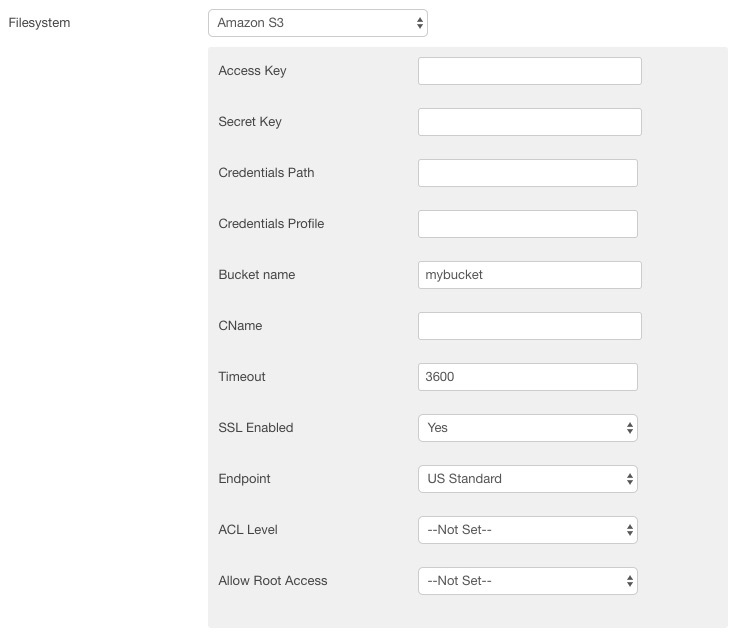 Enter in your Amazon S3 settings. Bucket name and Endpoint are required. Access Key and Secret Key are required if you are not using a Credentials Profile. CName - A Canonical Name for the bucket (Optional). With the Amazon S3 options set, you can now uses this as your default Filesystem, or revert to using the default Joomla! filesystem, and assign the Amazon S3 Filesystem to individual add-ons like the File Manager or Media Manager in the plugins parameters. Using a Credentials File for the Access Key and Secret Key recommended, as this does not store the Access Key and Secret Key in the database. Amazon provides an explanation of the Credentials File and Profile, but this plugin provides an additional option to set the full server path to the file, which may be required if the server HOME directory cannot be determined. If no Credentials Profile is set in the options above, then "default" is used. Add the Credentials Profiles and Access Key and Secret Key as required. In the Joomla Administration, go to Site -> System Information, and find the tmp_path value. Copy the value up to but excluding "/public_html"